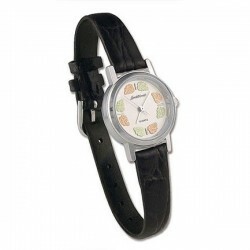 Watches – Ship Fast There are 6 products. 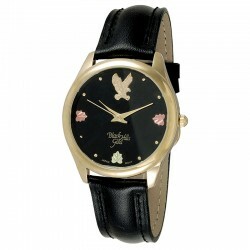 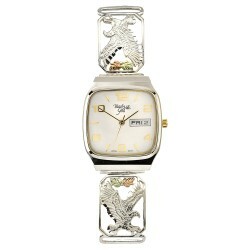 Elegant Women's Black Face Watch by Mt. 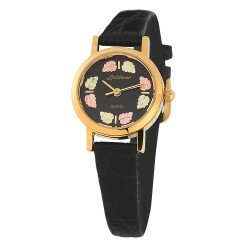 Rushmore Decorated with 12K Black Hills Gold Leaves 8mm wide Black Genuine Leather Band Stainless steel back Watch face: 24.84mm x 18.88mmComes in a gift box with a warranty card. 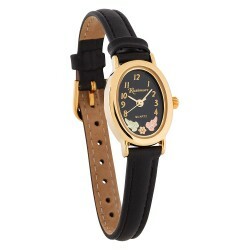 Elegant Women's Black Face Watch by Landstrom's® / 09250 Decorated with 12K Black Hills Gold Leaves 11mm wide Black Genuine Leather Band Stainless steel back 23mm diameter dial Made in South Dakota USAComes in a gift box with a Certificate of Authenticity and a warranty card. 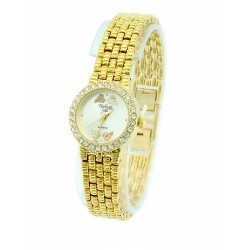 Sterling Silver watch band Decorated with 12k gold leaves Base metal watch case Stainless steel back Case measures: 35.85mm x 30.75mm Band length: mens standard Dial color: Champagne Movement: Japanese quartz Sterling Silver band is attached to the comfortable stainless steel expansion band.